The distinctiveness of a Jesuit education stems from its deep-rooted history and a mission grounded in faith and intellectual rigor. Since its beginnings in 1548, when the first Jesuit institution opened its doors in Messina, Sicily, Jesuit higher education has remained committed to academic excellence, service, leadership and caring for the whole person. 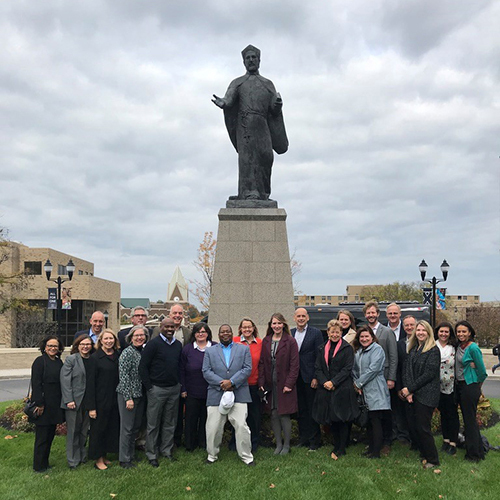 The Association of Jesuit Colleges and Universities (AJCU) offers Mission Integration Consulting as a way to help your institution strengthen its Jesuit identity. Click on the image to the right to learn more about our services in a PDF version of our new Mission Integration Consulting brochure. Questions? Please contact AJCU's Vice President and Consultant for Mission Integration, Dr. Stephanie Russell: srussell@ajcunet.edu or (414) 771-9342.